Backpainted Glass is a beautiful surface that offers fashion and functionality in a variety of applications. Glass is naturally reflective, so it will add a sense of spaciousness to any room. This reflective property also gives Backpainted Glass incredible depth of color. GlassWorks offers Backpainted Glass in Benjamin Moore colors, but if you cannot find the perfect color there, we can custom make glass in any color you choose. Backpainted Glass’ functionality comes from the clean, non-porous surface of glass. Bacteria and mold will not build up on glass surfaces, and they can be easily cleaned by with wet paper towel. 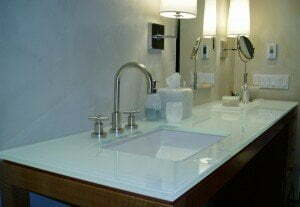 GlassWorks offers customized Backpainted Glass for a range of applications. Whatever your project, call our expert staff today and our design experts will work with you to plan and design the perfect glass for you.